Mick Farren’s Elvis Died For Somebody’s Sins But Not Mine is a must-buy for any of his fans. If you’re curious about Mick and unfamiliar with the stunning breadth and depth of his work, it’s a great introduction to this now lost talent. Mick's last collection includes some of everything: bits of memoir, reminiscences, rock journalism, cultural criticism, political writings, interviews with everyone from Johnny Cash to Gore Vidal, song lyrics, unpublished fragments, blog posts, a sampling of his nonfiction books, and excerpts from his novels. I purchased the book nearly a year ago, shortly after Mick died on stage in London. I’ve been taking my sweet time reading it. 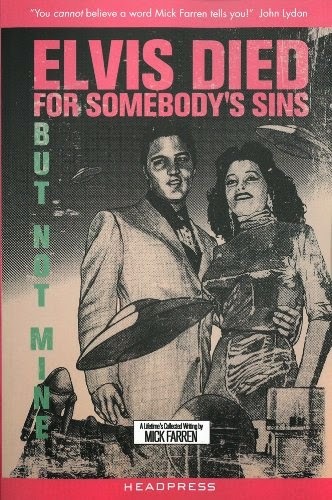 Whenever I finish reading a novel or complete a piece of my own writing, I’ll pick up Elvis Died For Somebody’s Sins and read several sections. Pick up the paperback copy here. A swanky hardback copy here.